When you want to use your fountain pen, it isn’t always as simple as grabbing the first paper you see to write on. 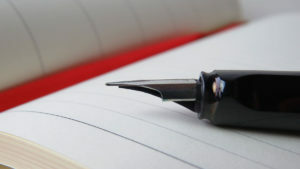 Choosing a quality notebook that is specifically designed to handle your fountain pen is a must. In this article, we’ll walk you through making a good selection so you can have an optimal writing experience. So you have just begun your journey with switching to fountain pens. You have already ordered or received your new pen, some ink, and a converter and can’t wait to start writing. But have you also ordered a notebook that will help you have the best writing experience with your shiny new pen? Whether you are a complete beginner to fountain pens or you already have a huge collection, this guide will be helpful for you. Sadly, most typical printer paper isn’t suitable for handling the ink or nib that comes with your fountain pen. It can feather, smear, or bleed through the sheet. This type of paper isn’t as bright, is not as smooth, and just isn’t as nice for writing. That’s why we have put together this list of the best notebooks for fountain pens on the market today.